Christmas & New Year Offers for Natural Food Store Customers and Norwich Lanes Staff Members!!! Chiropractic is an approach to health care predominantly focused on the nervous system and the integrity of the nerve innervation of the whole body. It is a non invasive and gentle approach, focusing on adjustment of the skeletal system; in particular the spinal column which is made up of 24 movable vertebrae, the sacrum and the coccyx. This bony structure houses the spinal cord, a soft structure formed from highly organised nervous tissue forming the channels of communication between the brain and the rest of the body. This is a familiar response when talking to someone who has never experienced chiropractic and the answer to the question is yes….your McTimoney chiropractor can treat your back but essentially we treat you….and that’s all of you, from head to toe. 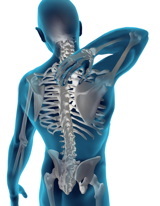 When the spine, which includes the cervical (neck) thoracic (rib cage area) lumbar (lower back) regions and the sacrum, (the posterior part of the pelvic girdle), becomes out of alignment then the spinal cord or peripheral nerves can be compromised leading to symptoms such as pain, pins and needles, loss of sensation, and weakness – or various combinations of these symptoms as a result of abnormal nerve function. Small misalignments can be detected through highly developed palpation skills of your McTimoney chiropractor who may adjust the bones in order to restore alignment. This will help to regain the structural and biomechanical integrity of the misaligned joint complex and in turn improve nerve function. Since its inception Chiropractic has continued to grow in popularity world wide and developed into various technique systems such as McTimoney Chiropractic, which is a whole body system that uses very quick, low force techniques that are applied by the chiropractor’s hands, and are suitable for all ages. As all body tissues are innervated by the nervous system, all areas of the body including internal organs can benefit from chiropractic as it facilitates the natural healing process that is a continuum within everyone. The whole body approach is a significant aspect to consider as internal organs can refer pain to areas distant to the organ itself, therefore continual assessment of the patients overall health is a vital part of the Mc Timoney chiropractic protocol. As mentioned the McTimoney method uses a wide variety of low force, very fast adjustment techniques which to the observer may appear very light but the key to the success of the adjustment is the high speed, dexterity and high level of accuracy with which they are performed. On occasion there may be an audible pop (cavitation) but this is not the aim of the McTimoney Chiropractor. Efficacy of an adjustment is assessed by re-palpation at every stage of the McTimoney treatment. At each visit to the Norwich clinic the skeletal system is assessed as a whole, and the patient’s posture, movement and general health all taken into account as an overall evaluation is made of well being. Postural advice is frequently part of the chiropractic consultation as misalignments may be the cause of poor posture, and inversely poor posture can lead to misalignments – often creating a catch 22 situation. It is a frequent occurrence for the patient to report pains or discomfort with no known cause, or to state that they haven’t done anything that may have caused their complaint, though through detailed evaluation of postural habits, often established over a number of years, it is often possible for their chiropractor to highlight potential causes of symptoms and advise for appropriate postural changes to be made. Patients may present to the Norwich clinic reporting an influential event that is the cause of their condition, but it’s not unusual to discover events as far back as a patient’s birth or in their childhood that have been forgotten, and that have significantly contributed to the presenting condition. This can be largely due to the body’s natural process of compensation. This compensatory process, whilst preventing further damage to the effected area, has the potential to cause changes elsewhere in the spinal column to which the body compensates once again and so on until it reaches saturation point, and the body is no longer able to compensate. Pain and discomfort are commonly the result. McTimoney Chiropractic is for everyone throughout life. You certainly don’t have to be in pain or discomfort to benefit from an optimally functioning nervous system! What happens during a Chiropractic treatment? At the first visit to your McTimoney Chiropractor in Norwich a very detailed case history will be taken. This will include details of past medical conditions and presenting symptoms. Your chiropractor will then examine all the joints in your body from head to toe and neurological tests performed. It will be necessary for the patient to undress to their underwear for the initial consultation though treatment gowns are available for follow up treatments if the patient wishes to use them. During the examination orthopaedic tests may also be used to gain a greater understanding of the presenting symptoms. Follow up treatments are generally shorter than the initial consultation and the number of sessions required varies greatly. The age of the patient is a determining factor as it is an unfortunate fact that we heal more slowly as we age. The duration of the symptoms also influence the treatment plan as a recent injury is likely to resolve earlier than one of long standing. The majority require from 2 to 10 treatments at weekly intervals initially. By this stage a noticeable change should have occurred though it may be necessary for chiropractic treatment to continue for longer. After any acute problems have been resolved it is advisable to keep up regular treatments in order to maintain correct alignment and keep your spine and other joints functioning well. These follow up treatments may have considerably longer periods between them, and duration determined by wellbeing. Detailed description of presenting condition. Detailed Patient history taken (this includes details of medication taken/ past or present injuries – illnesses) there may be relevant events as far back as a patients own birth. Cardiovascular, Respiratory, and Abdominal Screening. Consultations may be tailored to facilitate full testing of symptoms if necessary. Treatment following a new patient consultation may be given depending on the findings of the consultation. This will be at the discretion of the Chiropractor. There may be a need to refer you back to your GP to get permission to treat, to clarify details or even request further investigation. Postural analysis is another aspect of chiropractic that will be ongoing during your consultations, as it is essential for your chiropractor to know not only what you do, but also how you do it. After treatment you may feel tired as tensions within the body are released and this often allows you to sleep more soundly. Headaches may be experienced as waste products are flushed out of your system. Dizziness and light headedness may also be experienced as blood flow to the brain increases and tension is released. Menstrual cycle may be altered in character. This should settle as the body adjusts to its new alignment. Medication such as used by diabetics need to monitored before and after treatment. Feeling worse before you feel better; painful areas may change in size and intensity and new ones appear as your body adjusts to its new position. Muscles may feel sore or stiff as your body changes and its possible to experience symptoms of old injuries that the body has compensated for as these compensations are realigned. These feelings will disappear as your body settles down after treatment. During pregnancy the body undergoes many physiological, chemical and emotional changes; most noticeably the change in shape of the expectant mother and the postural changes that take place due to the increased weight carried anteriorly as the baby develops and there are also chemical changes that cause the ligaments supporting the skeletal system to become soft in order to allow the pelvis to widen during the delivery of the baby which causes joints to suffer additional stress. This combination commonly results in low back, leg, and shoulder pain. During pregnancy the mother may also suffer heartburn and indigestion, morning sickness, sciatica, back ache, and tiredness. The whole body approach and gentle nature of McTimoney Chiropractic makes particularly suitable for pregnant women during this difficult period in their lives and can enhance the health and wellbeing of the mother and the developing baby. The expectant mother can be treated from the third month onwards to help overcome pain and discomfort and help the body as it changes in preparation for the birth of the baby. For a new mother continued chiropractic treatment can be beneficial as the physiological and emotional changes continue. The new routines are formed, inevitably sleep patterns are altered, and the new mother starts lifting and carrying in different ways, all at a time when the body is trying to regain its former condition. A Mc Timoney chiropractor may also be able to give advice, on stretching exercises, lifting techniques, and posture to prevent further injury during the pregnancy and for the new mother. Being born and squeezing through a small birth canal is probably one of the hardest things we do as humans. During this process the babies head absorbs much of the shock as the soft bones yield, a process called “moulding” which facilitates the baby’s journey down the birth canal. Once born most baby’s cope well and go through a process called “unmoulding” when the head goes back to a more normal shape, however if this process does not complete satisfactorily, maybe the result of a difficult birth, the baby can be left in some discomfort. This discomfort can result in the baby being irritable, fractious, continuous crying, feeding difficulty, colic, sickness and wind, difficult to settle and poor sleep, distressed when lying down and when picked up. These symptoms or any combination of these symptoms may indicate a misalignment in the baby’s skeletal system and this can be very distressing for the baby and the new mother. Childhood can be a rough and tumble affair with knocks and bumps on a regular basis most of which, children are able to shrug off, however some incidences can lead to more persistent discomfort causing poor concentration, irritability, headache, migraine, neck or back ache. Chiropractic treatment has also been recorded as being helpful for many conditions that have not been the result the rough and tumble of daily life, such as learning difficulties, behavioural problems such as inattentiveness, difficulty sitting still, poor coordination, hyperactivity, vulnerable to infections, sinus, dental problems, all of which may be the result of skeletal misalignment and a disturbance of nervous system. As we go through life there are many things that shape and mould us, the jobs we do, the hobbies we have, plus all the natural degenerative changes that come to everyone. Many older people report feelings of depression, reduced mobility, stiffness, while some symptoms may be the result of a specific physical condition such as arthritis or the result of a physical injury, others may be the result of natural wear and tear. The gentle nature of McTimoney Chiropractic makes it particularly suitable for the older patient, even those with osteoporosis and has been found beneficial for a range of conditions such as; Arthritis – osteoarthritis and rheumatoid, poor circulation, dental and denture associated pain, recovery from falls and accidents and can greatly improve mobility. Though Chiropractic is not able to reverse the effects of degenerative diseases such as arthritis, regular Chiropractic treatment can help to reduce further damage. Chiropractic is not just for those with painful symptoms. One of the body’s natural responses to misalignment is compensation and this may not produce painful symptoms, however compensation frequently causes a compromise in performance. Prevention is better than cure and Georgina has found maintaining natural balance and posture has helped many people to improve their performance in sports, such as horse riding, golf, football and general daily activities. For all serious health concerns we recommend discussing any issues with your GP prior to treatment.